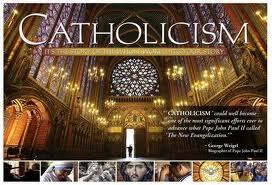 Looking to re-ignite your love of the Catholic faith? Have questions about Catholics? Curious about what the faith is really about? This is for you! This widely acclaimed, stunning ten episode DVD series takes us to every corner of the globe and deep into the Faith. In breathtaking, high-definition cinematography, the beauty, goodness, and truth of the Catholic Faith are illustrated in a rich, multimedia experience. Journey with acclaimed author, speaker and theologian Fr. Robert Barron to more than 50 locations in 15 countries as he illumines the spiritual and artistic treasures of this global culture that claims more than one billion of the earth’s people. From the sacred lands of Israel to the beating heart of Uganda…from the glorious shrines of Italy, France, and Spain, to the streets of Mexico, Kokata, and New York City, the fullness of Catholicism is revealed. To register, please email the Christian Formation Office or call 262-796-3944. Do not miss this inspiring experience! Bring a friend.